Even though popular video games often lack positive LGBT representation, independent and alternative games have stepped forward to fill this gap, offering deeper, more personal stories that strive to make players empathize with LGBT protagonists. Admirably, Talks With My Mom places players in the shoes of a young woman coming out as a lesbian to her narrow-minded mother, while Dys4ia uses a series of mini-games as metaphors for the struggles of a transwoman. However, even the best intentions can suffer from faulty execution. There’s a difference between a complex narrative focusing on a gay person’s life and a trivial tale with a gay protagonist that doesn’t say anything substantial. Belladonna, the debut title from Swedish developer Neckbolt (Niklas Hallin), is regretfully in the latter category. Belladonna is yet another game that has potential to tell an intriguing story but never manages to convey its ideas. It’s quite a pity as there’s a wealth of topics that could have elevated the game beyond a simple Frankenstein pastiche. In the short time I spent playing Belladonna, I learned about a marriage crumbling after the death of a couple’s infant son, a previously loving husband’s descent into an abusive, domineering maniac, his neglected wife’s turning to the affections of their maid to rekindle her appreciation for life, and a sad fate for all three once this clandestine romance is exposed. This material could have made for a gripping character drama if I had been able to see it develop rather than learning about it after the fact. Belladonna shares the same significant flaw that hindered Gone Home — practically every important aspect of the plot is revealed through exposition. You never observe the von Trauerschlosses as a couple and are left to simply assume that Wolfram and Belladonna were madly in love before their son passed away. You never witness that first spark of desire between Belladonna and the maid Klara that rejuvenates the former’s spirit. There’s no montage of Wolfram slipping further into darkness as he becomes obsessed with his experiments and more paranoid that his wife is having an affair. Everything that is supposed to define these characters is merely spelled out in journal entries. Not even the epistolary revelation of the backstory is properly handled because of how ubiquitous these journal entries are. At least one page is located in each room, and at one point I found three in the same area. Such rushed delivery greatly hurts the pacing since there is hardly any time to absorb the information before dealing with another turn of events. The story in the journal entries doesn’t even match up with how the game’s events play out. Belladonna’s notes suggest that she was madly in love with Klara, that she considered the young servant her true soul mate and didn’t care that the society they lived in would condemn their relationship. Yet when Klara finally locates her lover and restores Belladonna to life, there’s no sense of a deep connection between them. Aside from one or two hollow uses of “my love,” their dialogue is just more exposition. Nothing indicates that these two had been in a serious relationship. While this could be due to the fact that both women had returned from the dead, the lack of emotion between the characters makes no sense given Klara’s behavior after her resurrection; she shows some feelings, though usually it’s either a sense of confusion or curiosity. Why does the game heavily emphasize a forbidden love only to have it fail to manifest when Belladonna and Klara reunite? The romantic subplot isn’t the only concept that needed more exploration. 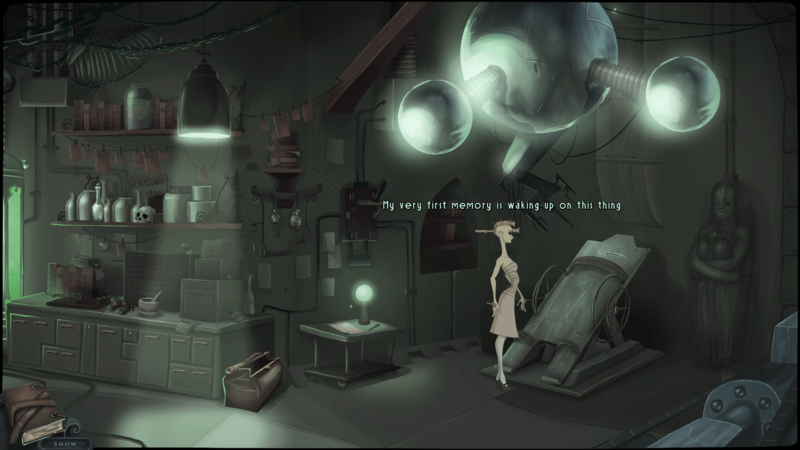 Near the end of the game, Belladonna reveals to Klara that she wishes to use her husband’s research to create a race of clockwork-powered undead, and that they will find their own home where they can be safe from the outside world. Is this supposed to be an allegory for the gay community feeling threatened by a society that ostracizes it, or is it a simple rehashing of a generic science-fiction plot? Before embarking on this plan to create a new species, Klara confides in Belladonna that she fears the revival process has made her into a monster. Klara shares that she felt no guilt killing a cat that was guarding a key she needed, so she is concerned she is now devoid of a soul. Belladonna then confesses she had no qualms about murdering her husband (which is justifiable considering the hatred she felt toward Wolfram for killing both Klara and herself) and tells Klara to ignore her fears. Why ignore it? Why not discuss the nature of humanity and the possible existence of a soul? Why not examine whether Belladonna is unleashing an army of merciless killers upon the world or if they have some semblance of a conscience? But the issue is never again discussed: Klara gathers the parts needed to create a new patchwork corpse, she flips the switch to infuse it with electricity, and Belladonna declares “It’s alive.” With this unthinking ending, the game announces that it’s just the latest indie project with aspirations of high art held back by lazy design.